Vatican City is actually just a part of Rome (click here to see the map... just in case you need it! ), rather small, but it's also an independent state and very famous in the whole world! But I'm not going to tell you anything about the Vatican... if you want to discover the beauty of it, with it's artistic masterpieces by Michelangelo, Raffaello and many other famous artists, you have to visit here: a short description cannot give you a true impression of it and, moreover, it's not the goal of this web page! Let's see the Vatican from the point of view of a plate collector! Vatican started making license plates in 1930, one year after the Patti Lateranensi, the agreement between the Italian and the Vatican State, and they have always been attached to the vehicle with a lead seal with the coat of the arms of the Vatican: it's possible to see it in many of the pictures shown in this page, though not clearly. The first plates were not that different from those that you can see nowadays: black on white, with the letters SCV and then a serial number. On motorcycles, tractors and other vehicles of this kind, the serial number started with the digit 0. 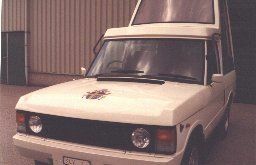 The private vehicles of the residents had Italian registrations, at first in the EE series, later standard Italian plates, while SCV plates were issued just for state vehicles. 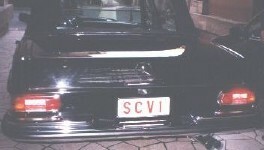 At the beginning front plates were smaller like all old Italian plates (picture 3) and back plates had the letters "S.C.V." on the top line and the number on the bottom (picture 1), even if there were some plates on just one line (picture 2). Then in 1981 the size of back and front plates became 30 x 10 cm, with the prints on just one line. I have to add that the dots between the letters SCV, as you see in the pictures, sometimes were not present. 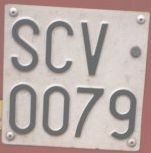 *) The same plates for motorbikes are also used on mopeds with engine of 50 cc (Italian plates for mopeds and motorcycles are different), on tractors and on small work vehicles: in fact the plate SCV 0079 (picture 7) was not mounted on a motorbike, but on a tractor. 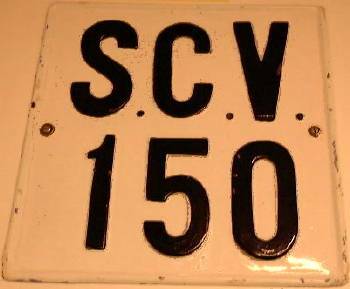 Anyway this habit isn't new, but was in use also in the past: plates for motorbikes and tractors issued before 1988 were the same, with the letters SCV on the first line and a number with a leading zero in the second. 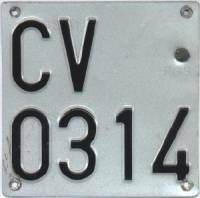 There are also special plates coloured red on white for the Pope and Cardinals: they are from SCV 1 to SCV 100 (approximately) with the number before the letters on the front and after on the rear (pictures 9 and 10). The first plates of this kind had also a badge with the coat of the arms of the Vatican State in golden metal on the left, as you can see (or maybe just perceive!) in the two pictures below (pictures 11 and 12), though their quality is very poor: if you want to see the full picture I took the second of these plates from, go to the page of the old photo gallery (picture 5). Anyway this badge was removed after the Second World War. There are rumours that there is more than one SCV 1 plate (pictures 10 and 12) for the Pope, installed on different vehicles: I don't know if this is true or not, but I'm very sure he can do it and nobody will complain!! :-) The plate SCV 4 (pictures 9 and 11) is mounted on the "Pope-car": it's the vehicle used by the Pope when he goes among people greeting them: you can see a picture of it clicking here. The last picture (picture number 13) shows a plate with the full print "Stato Città Vaticano", but I'm not very sure about what kind of plate it is because plates like that have never been used. It was mounted on a truck of Vatican City that followed the allied troops to pick up the dead bodies of fascists from the streets. So it probably was not a real plate, but more likely it was a distinguishing mark and this can explain why it's different from all the other Vatican plates. About ovals: I know people with different opinions about this topic. Anyway, Paolo Troncatti told me that he saw ovals with "V" on cars with Vatican plate, so that has to be the correct one. Actually I also saw a V oval on some cars from Venice: somecrazy men over there would like to be independent from Italy and made these unofficial and silly ovals for their cars!! I want to thank so much Louis Fierens for the first picture, Vincent Moens for the second and the third (note that they're a matched couple), Drew Steitz for the sixth, Frans de Been for the pictures number 7, 9 and 10, Peter Auckel for the number 11 and Roberto Pola for the last two (picture number 13 is taken from the book "I giorni dell'odio").